For example, in our core camera business, in addition to our overwhelming share of the DSLR market, we will go on the offensive and work to expand our sales in the mirrorless camera market, which is exhibiting remarkable growth. This will allow us to reach our goal of 50% market share of the entire interchangeable-lens camera market. And they'll probably be able to reach that goal. Actually they are now (as well as Nikon) at very risky situation. As they need to declare move to different mount and different lenses made for contrast and dual AF. IMHO it will be an interesting period to follow. A small market earthquake. Popcorn and coke apart, I think fan boys underestimate Canon power. It's huge. It sells bazillion of dlsr. It produces own sensors, has a huge RD dept capable of patents at 360 degrees. Canon is the only one which operates on several completely different markets. Even its long delay on this segment could be of some advantage to them at this point: regardless of the reasons behind, they were out of the mirrorless arena until market was mature and now they can enter it in style.There's nothing in current mirrorless camera that cannot be made by Canon. They will leverage on their limitless customers and lock-in. They missed the mirrorless train (like they abandoned the vidDsrl market they invented) for their manager ineptitude (or choice), not their engineers ineptitude. Just my opinion in front of a beer. Looking at the things in static can lead to wrong conclusions. 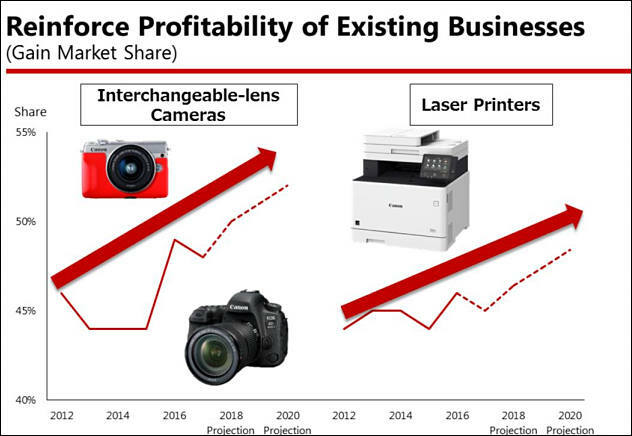 Canon in the past had been quite innovative company, how it is driven by reaction and profits maximizing. Hence so loud statements that also had been made during last M mount announcements that all mostly flopped. @LongJohnSilver What do you mean that Canon is the only one which operates on several completely different markets? Panasonic, Samsung, and Sony all operate in a number of different markets. @eatstoomuchjam Sorry for the error. I meant a comparison with Nikon. Anyway guys... We'll see :) I think that Canon market shares are so big that once they have a decent mirrorless system, a flood of peoples will run to buy it. @LongJohnSilver A lot of people said similar things about Ampex (video equipment) in the 1990's when the transition to digital tape formats was happening. Ampex was a huge business with massive support in the aerospace sector. It only took 12 months for them to be effectively out of business due to a misjudgement of the market, which led to unwanted products. @Davenport I see you point but here we are not speaking about a drastic tech paradigm change like that. That one is comparable to film/digital camera transition. Anyway I'm not a Canon fan boy. I'm just pessimistic or maybe realistic. Canon is a lumbering elephant of a photographic company. That being said when and if they decide to change course the elephant can stomp most things in it's path. All they have to do is decide to pack the technology of today in there cameras and not hold back than watch out. Those of us old enough remember them throwing out the old fd lens mount for the new EF and the fuss it created. Now it seems even cinema cameras have EF lens mount options. I think the Canon wish for the future should be understood as a japanese view as a sufficient far goal. @LongJohnSilver It wasn't the technology change that killed Ampex, it was the omission of a feature in their digital tape recorders that Sony had included in Digital Betacam, called "pre-read editing". Ampex dismissed it as a gimick, but it allowed A/B roll editing with one less VTR required. This was a big cost saving at a time when the accountants made purchase decisions. I experienced the Ampex sales people trying to tell customers that they did not need the pre-read feature. They ignored their customers. Let's hope Canon don't ignore their customers!